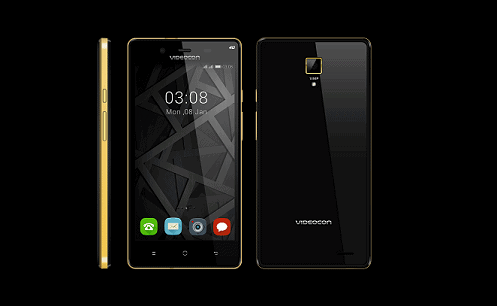 NEW DELHI: Videocon Mobile Phones has unveiled a new 4G smartphone, the Z55 Krypton, priced at Rs 7,999. Backed by 1 GB RAM and Android 5.1 (Lollipop), the phone is powered by 1.3GHz quad-core processor. It comes with 8 GB internal memory that can be expanded via microSD cards. The phone offers a 2,200mAh battery and connectivity features like Bluetooth, GPS, Skype, V-Secure, Wi-Fi and dual-sim functionality. This handset comes with a 13MP primary camera and a 5MP front shooter. The phone has a bar-shaped encasing with golden bumper and 5-inch HD IPS display. The phone has a DragonTrail X anti-scratch glass in the front with same the same glass on the back of the phone to protect the device from scratches. Videocon Mobile launches Z55 Krypton 4G smartphone at Rs 7,999 0 out of 5 based on 0 ratings. 0 user reviews.